Half of the fruit that grows in yards and public spaces is never picked or eaten. Citrus trees are burdened with misshapen lemons, berries grow in tangled thickets on the roadside, and the crooked rows of abandoned orchards fill with fallen apples. At the same time, people yearn for an emotional connection that's lacking in bland grocery store bananas and tasteless melons. The Fruit Forager's Companion is a how-to guide with nearly 100 recipes devoted to the secret, sweet bounty just outside our front doors and ripe for the taking, from familiar apples and oranges to lesser-known pawpaws and mayhaws. 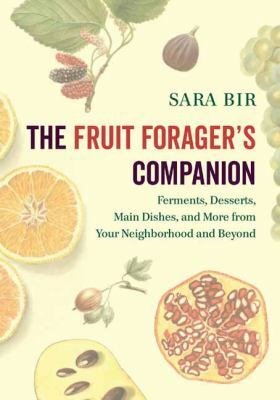 Sara Bir--a seasoned chef, gardener, and forager--primes readers on foraging basics, demonstrates gathering and preservation techniques, and presents a suite of recipes including habanero crabapple jelly, lime pickle, pawpaw lemon curd, and fermented cranberry relish. Bir encourages readers to reconnect with nature and believes once the foraging mindset takes control, a new culinary world hiding in plain sight will reveal itself. Written in a witty and welcoming style, The Fruit Forager's Companion is a must-have for seekers of both flavor and fun.